Nancy and her friends Bess and George spend an exciting week exploring a mysterious zigzag house with its fantastically crooked staircase, its bizarre serpent picture, and an unpredictable robot that nearly causes the young detective to lose her life. 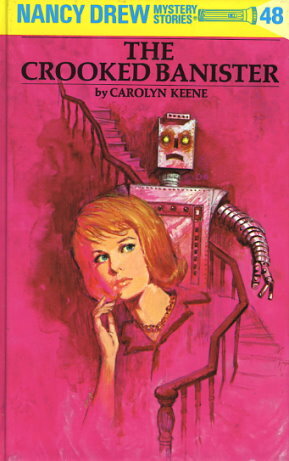 But despite the threat of danger from the robot, Nancy is determined to solve the mystery of the weird house and to locate the missing owner, who is wanted by the police. It takes keen logic and quick thinking for the young detective to plow through the tangled thicket of clues and find the key to this complex puzzle. With the help of her friends, Nancy captures an elusive swindler and uncovers the secret of the crooked banister, but not before they have several hair-raising adventures -- one on a broken bridge over flaming water, another in a hidden room with poisoned portraits!